Coastal Boats or “Steamers” hold a fond place in the hearts of St. Jacques residents whose memories reach back to the early eighties and beyond. Fond recollections of the ships whistle as it rounded the point, trips taken or the rush wharf-ward to welcome each visit, are widely recalled. Through the eyes of a child these ships were of mammoth proportions and stories of their heroics intrigued young minds. So much so that the mere mention of a ships name evokes stirring memories. There was one such vessel which travelled with me into adulthood and only recently was I able to piece together the details of its St. Jacques connection. Beginning in 1851 when Newfoundland assumed control over its postal service, a marine shipping service took root along the coasts of the island and Labrador which not only shaped the course of history along those coasts but also the lives of generations. Initially the vessels were wooden schooners hired by government to carry mail within regions such as Placentia and Fortune Bays. Their itineraries saw them travelling to and from designated ports dropping off and picking up mail. Not all communities had harbours accessible to schooners nor did all communities have wharves where they could dock in those days. Consequently there were key delivery points from which mail was further delivered overland to other communities. Some of these mail routes later became roads between communities while others retained their status as trails and are still known today. A decade later the government, in response to a combination of need and demand, decided to implement a regular steamer service which would also carry passengers. The first of these was the Victoria, followed by the Ariel, the Leopard and the Tiger, all of which provided service in various parts of the country. Throughout the next century ships with names that include the Conscript, Volunteer, Alert, Hump, Home, Bruce, Sagona, Fogota, Clyde, Argyle, Ethie, Fife, Lintrose, Meigle, Dundee, Prospero and the Virginia Lake served along the extensive Newfoundland coastline. Along the south coast more familiar names include the Northern Ranger, Glencoe, Kyle, Burgeo, Nonia, Springdale, Bonavista, Bar Haven, Baccalieu, Malakoff, Hopedale, Petite Forte and Taverner. In later years the smaller and faster Marine Runner, Marine Courier and Marine Sprinter offered the service as road networks reduced the need for larger vessels to provide coastal transportation and shipping. One steamer, now almost forgotten in terms of its service along the south coast is the S.S. Portia named after Portia the heroine of William Shakespeare’s play, The Merchant of Venice, whose beauty was matched only by her intelligence. The Portia has a particular connection with St. Jacques, one which occurred on the night of March 18th, 1921 during a severe and blinding snow storm. This Portia wasn’t the first ship by that name to ply Newfoundland waters. The first Portia provided service between St. John’s, Halifax and New York City for fifteen years between 1884 and 1889, the year it was wrecked on the shore outside of Halifax. Following the wreck the Portia was replaced by a new vessel, the Sylvia, on that run. The second steam ship, the S. S. Portia under discussion here, was built by the firm of Murdoch and Murry in Glasgow, Scotland and launched on July 02, 1904. The ship was owned by C.T. Bowring & Co Ltd, of Liverpool until 1912 when its ownership was transferred to Bowring Bros Ltd. Of St. John’s. Bowring & Co were hired by the Newfoundland government to deploy the S. S. Portia as part of its coastal service. 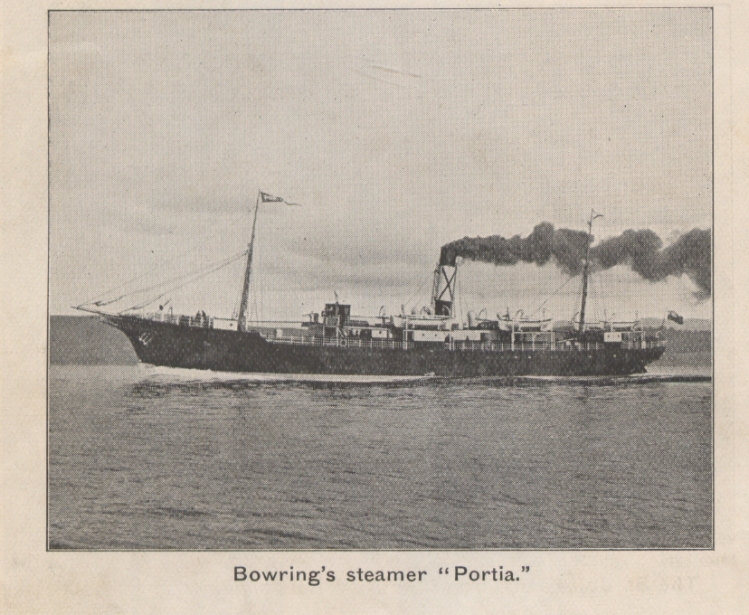 When Bowring’s’ subsidized coastal steamer contract expired in 1923, ownership of the Portia was assumed by the Newfoundland government as part of the Newfoundland Railway. It continued to serve coastal residents until it was retired in 1940. 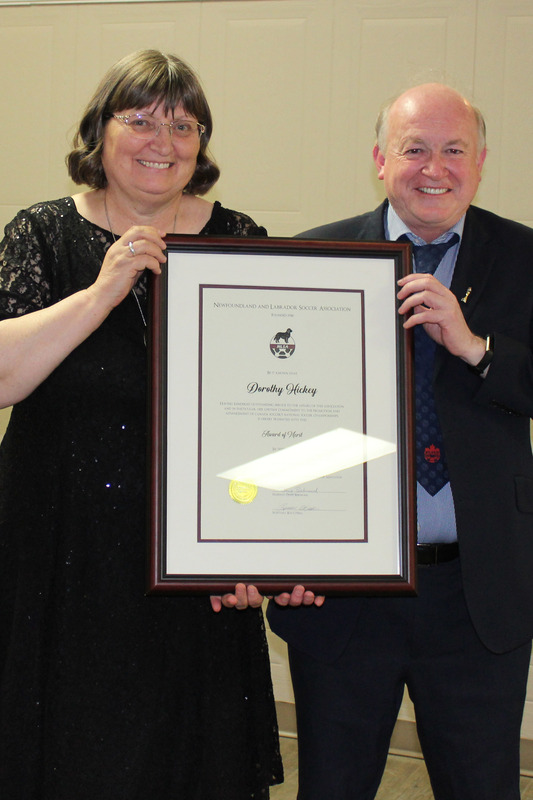 The Portia and Sagona were both retired that year and replaced by the Burgeo and Baccalieu. In 1941 the Portia was sold to Bowater’s Newfoundland Pulp & Paper Mills, whose head office was in St. John’s. In 1942 the Portia was again sold, this tie to N.D. Allen of Panama where it remained until 1945 when its ownership moved to Manuel Velliantis, also of Panama. In 1946 Kapotis & Baits of Alexandria, Egypt became the Portia’s new owners. This didn’t last long for she was destroyed in a fire on October 27th, 1946. The luxurious Portia could accommodate 150 passengers. The vessel became quite well known in coastal Newfoundland. Captain Abram Kean brought the vessel from Scotland on its maiden voyage and was the ship’s master for most of the next 15 years during which it served on both the “Northern Route” and the “Southern Route”. Wesley Kean, J.W. Kean, Thomas Connors and Thomas Pierre Fitzpatrick all commanded the steamer. This was the elegantly described vessel which, on its regular trip along the south coast in March 1921, encountered what was reported to be a severe blizzard upon entering Fortune Bay. This was likely a Nor’easter which had developed along the eastern seaboard of continental North America and steered northeast to Newfoundland by the jet stream. Typically this type of storm is preceded by a slow-moving high pressure area which parks itself over Newfoundland. This condition captures cool moist air which the nor’easter bring onshore in the form of high winds and blowing snow resulting in a winter storm which can lash away at the south coast of the island for several days without break. Under the circumstances the Portia was forced to make a run for St. Jacques where greater shelter and safety beckoned. Grand Bank, because of its inadequate harbour, could not offer shelter from the heavy southeast winds and driving snow. Captain Tom Connors, a veteran sailor who was no stranger to sea and wind conditions on the south coast, charted a course in a north-north-easterly direction for the entrance to St. Jacques Harbour. It was reported that the snow fell with such intensity that the light on St. Jacques Island, normally visible out the bay as far as Garnish was not visible first or last. Not a glimmer could be seen from the beacon mariners had come to rely on in the thirteen years since its installation. As the ship approached her sheltered destination those on the Bridge peered fruitlessly through the blinding wall of snow and darkness for any familiar feature. Though they knew their charts and trusted their compass, fiercely buffeting winds left the crew with an uneasiness that would only dissipate once they lay at anchor or tied to a wharf in St. Jacques. It is highly likely that someone on the bridge had been keeping an eye clock-ward thinking they would soon be nearing shelter when a shudder passed from stem to stern, the howling winds out-classed by an even more sinister sound of metal scraping the ocean bottom. Searchlights were hastily pointed downward as the ship came to a stop, loose objects chaotically tumbling and flying with the impact. Crashing waves sent spumes of spray through the intense beams of light now scanning the near invisible shoreline. It was this jettisoning of cargo that led me to the event. As a child my grandmother told me a story of how my great-grandfather had secured a full barrel of flour from the ocean when a steamer ran aground outside the harbour in a winter storm. I remember asking why the flour didn’t get wet while it was in the water and she explained how it only got wet on the outside and that prevented the water from going any farther. She added that other people from the community were also successful in securing a variety of merchandise and food supplies. Grandmother went on to tell me that the steamer’s name was Portia. Many times during the ensuing decades I wondered about the story and I wondered about the Portia. As an adult I asked my parents, uncles and aunts as well as other elderly people about the story but none remembered any details of it. With no evidence of a wrecked vessel on the coastline west of St. Jacques harbour and no witness to corroborate the story I had just about concluded it was nothing more than a story to intrigue a small child’s curious imagination. A couple of years ago I began thinking about the story again. This time I took a research approach. I reasoned that grandmother must have either heard the story from my great grandparents or had witnessed it during her earliest days in St. Jacques after marrying my grandfather in 1924. Since none of her children knew the story I concluded it happened before they were born. Thus, my search began. I found out that the Portia was introduced to coastal service in 1904. That gave me a twenty year window through which to narrow my focus. Research into coastal boat schedules placed the Portia on the north and east coast during her first years of service which further narrowed the window. From there it simply became a day-by-day review of newspapers from that time focusing on the winter months. It was through this I found out my grandmother had been sharing with me oral history in the best way that such histories are told – in story form. The Portia was specially fitted in the bow to contend with ice. She was frequently called upon to break ice in harbours and channels as she made her way along the coast. This was particularly true in the Bay of Islands, especially in Corner Brook, one of her furthermost port of call on the west coast. This reinforcement worked to her advantage on that day in Fortune Bay. Newspaper reports on March 21st spoke of the storm and efforts to re-float the Portia. This was successfully done Monday morning with assistance from the S.S. Senef and the S.S. Daisy who secured cables to the Portia and with the buoyancy of a rising tide coupled with the offloading of cargo, tugged her back to a floating position. The Portia then proceeded to the wharf in St. Jacques under her own steam. Initial assessments showed there were no punctures or serious damage to the hull. However, in the interest of safety it was decided the trip westward would be cancelled and the Portia would return to St. John’s to go on dry dock to carry out whatever repairs were necessary. The New York Times, March 21, reported that “The mail steamer Portia was re-floated this morning at high tide and is coming on to St. John’s under her own steam, after being on the rocks at the entrance to the harbour of St. Jacques on the coast of Newfoundland for the better part of two days.” Captain Connors took the ship to St. John’s arriving there at 1:30 on Thursday of that week. In St John’s a diver by the name of Squires was sent down to examine the hull of the Portia to determine whether or not she needed to go on dry dock. He carried out a detailed inspection and concluded the ship was sound and would not need any repairs. The reports of the accident place the Portia aground either a mile and a half west of the entrance to St. Jacques Harbour or immediately outside of the Harbour. It seems unlikely to me that the experienced Captain Connors would miscalculate a course he had completed many times before by a mile and a half despite the weather. The shoreline at that distance from St. Jacques Harbour is fairly rugged in areas with underwater crags which could readily damage a hull. On the other hand, there is a gravel beach just west of the harbour entrance where, had the Portia struck there, it is likely she wouldn’t have suffered much damage. Since the Portia didn’t suffer any serious damage from the grounding this seems most likely. An error of a hundred feet during a blinding snow storm is understandable. The Portia held a special place in the hearts of people along the south coast and even though they were inconvenienced by the accident they remained appreciative of the service the ship provided as their only transportation highway. Though the names of vessels changed with the years that mode of transportation helped foster social identity, commerce, communication and economic development. Perhaps most of all it contributed to storytelling and the sharing of culture among a people who measured their lives by the visits of coastal boats. by far a very interesting and most enjoyable article which captures an event from the past a gives it a place in the present. I enjoyed reading and imagining my family members who lived in St Jacques at the time Portia was sailing. Great research…. I was too young to see the Portia…….any time we visit St.John.s..we visit the Railway Museum.. and reminisce about seeing the ships of the 40′,s and 50′,s..Thanks for highlighting the Portia..and paying tribute to it’s Captains. Just finished reading your research on the SS Portia. I was particularly interested because my father Charles Clinton Burke was a steward on the Portia during 1920s. I remember him saying, that Capt. Tom Connors was the best Master he sailed with on the coastal runs. THanks, Alex, I shall get in touch with some other info re: my family – FR. Charles B. Would the name Moira Burke fit in your family tree? I am doing some research for a gentleman who told me his grand father was Charles Clinton Burke and he sailed on the steamers. I would love to give him some further details on his NL roots.